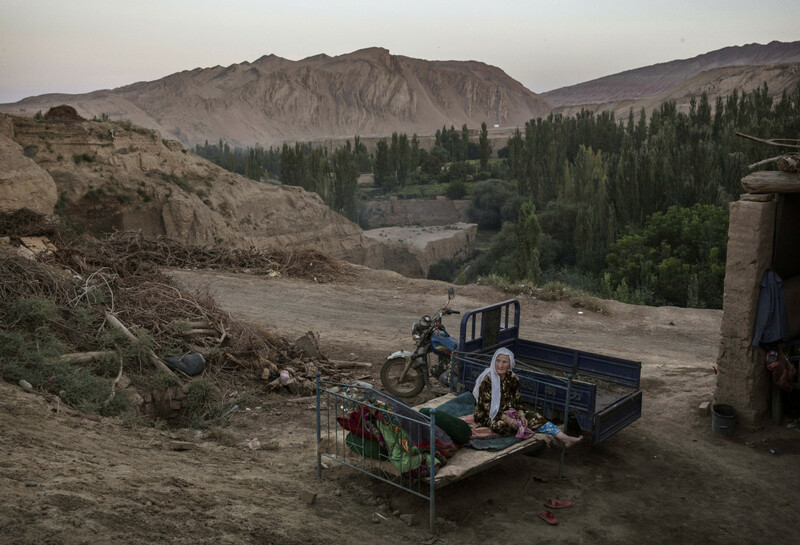 A Uyghur woman sits on a bed outside on September 12th, 2016, in Turpan County, in the far western Xinjiang province of China. With international human rights activists up in arms over how to help the up to one million Uyghurs locked up in re-education camps in China&apos;s West, analysts remind us that the United States has played—and is playing—a major role in inspiring overwhelming human rights violations there. Long before the September 11th attacks and the U.S.&apos;s subsequent Global War on Terror, China was engaged in a worldwide bid for oil and gas. Abutting China&apos;s far Western region of Xinjiang, home to the Uyghurs and several other predominantly Muslim Chinese ethnic minorities, are major energy exporters like Kazakhstan. Perennial uprisings by Uyghurs against socioeconomic marginalization have threatened imports meant to be funneled through the Xinjiang region to literally fuel the Chinese economy. Beijing had branded Uyghur uprisings as separatist activity, but advocates for their betterment in Chinese society—like Professor Ilham Tohti, currently serving a life sentence on what free expression advocates call trumped up charges—have argued that their woes are not unlike those of all Chinese advocates for accountable government: rampant corruption, the disproportionate allocation of resources to China&apos;s ethnic majority Han, and the absence of meaningful political representation. 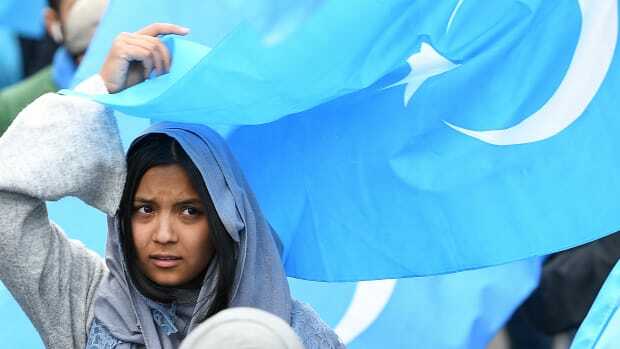 Following the September 11th attacks, amid President George W. Bush&apos;s War on Terror, China began to report the existence of a Uyghur separatist terrorist group called the East Turkestan Islamic Movement. But observers of Western Chinese affairs frequently countered that, as with most information on Xinjiang, all information on ETIM had been funneled through Chinese officials and state-owned media. 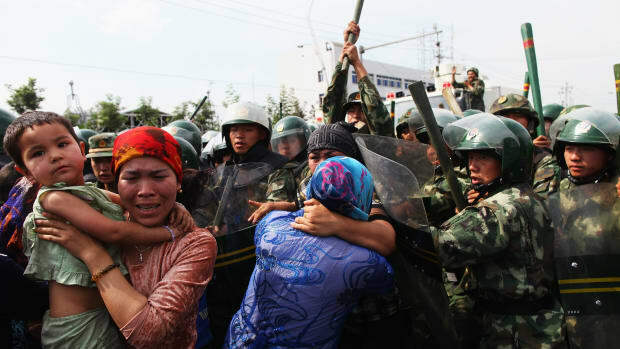 Many have suggested that distorted claim of terrorism arrived as a pretext to legitimize Beijing&apos;s perennial crackdown on Uyghur civil liberties, including extrajudicial killings of alleged separatists to the suppression of the Uyghur cultural and religious identity. "Academics who cover terrorism in China and Central Asia have said that, prior to 9/11, they had never heard of ETIM," says Peter Irwin, the spokesman for the World Uyghur Congress rights group. "China only pressed to have a group with this name designated as a terrorist organization after 9/11, when they recognized the international political climate was ripe for exploitation." "The language emanating from Beijing on terrorism was tepid at best prior to 2001. Following this, there was a clear shift in tone to capitalize on the auspicious political environment," Irwin adds. Henryk Szadziewski, a senior researcher at the Washington-based Uyghur Human Rights Project advocacy group, explains that the entire lexicon around Uyghurs changed after 9/11. What had been labeled just "separatism" before became "terrorism." "This sleight of hand offered a basis of justification for the Chinese state&apos;s repressive policies toward expressions of ethnic identity, religion, and political rights," Szadziewski says. "The strategy of aligning policies of repression with global security trends is still in place, as seen with the justifications offered for the mass internment and extensive surveillance of Uyghurs. State media has portrayed these facilities and policies as no more than the kind of measures in place in Europe." And, more recently, under the presidency of Donald Trump, whose travel ban barring five Muslim-majority nations was recently upheld by his freshly reshaped Supreme Court, and a wave of international populism that has often targeted Muslims, Beijing has found renewed legitimacy in a crackdown that has now devolved into what many are calling a humanitarian crisis, disappearing and torturing hundreds of thousands across the Xinjiang region. 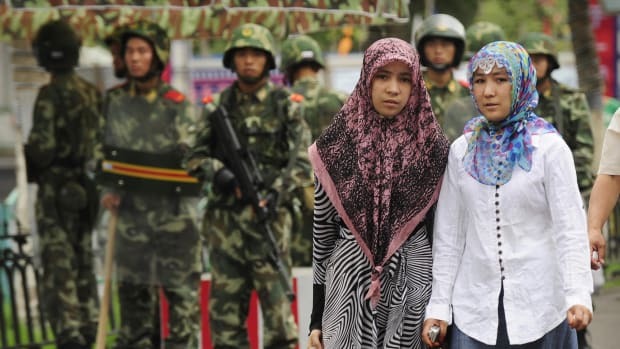 "Islamophobia has been an enabling factor in justifying Chinese government policies of repression—particularly those framed as security measures," Szadziewski says. He adds that Muslim-majority nations also share blame for their silence on the actions of Beijing, which remains an evidently indispensable business partner for nations from Southeast Asia to North Africa. The West may not be directly responsible for the camps, but must share in the blame for the current crisis, Irwin says. "While this external environment did not lead to repressive policies toward Uyghurs in the first place—China has restricted Uyghur rights for decades—it has provided convenient political cover to conduct supposed counter-terror operations that go far beyond targeting perpetrators, but to collectively punish the entire Uyghur population." The camps, reported to have launched in the spring of 2017, just after Trump&apos;s inauguration, represent a major escalation of Beijing&apos;s previous policy concerning Xinjiang&apos;s Uyghurs. I traveled to the far-flung Xinjiang city of Turpan in 2010, where I found evidence of religious oppression prominently displayed in one city mosque. At the time, for example, authorities forbad minors from entering mosques, opponents charged as a means of assimilating them into mainstream, secular Chinese culture. The people I visited explained that, far from the big city, their children continued to attend mosques for religious education. 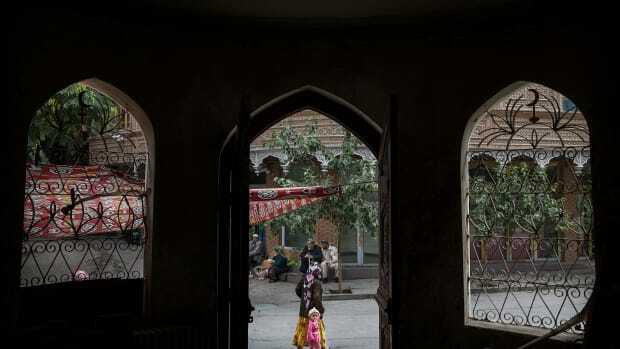 But now it seems that the police state experienced by Chinese Muslims has extended itself to Turpan, which reports have shown is now home to re-education facilities. Whether the Trump administration is in a position to act is under question by some observers. 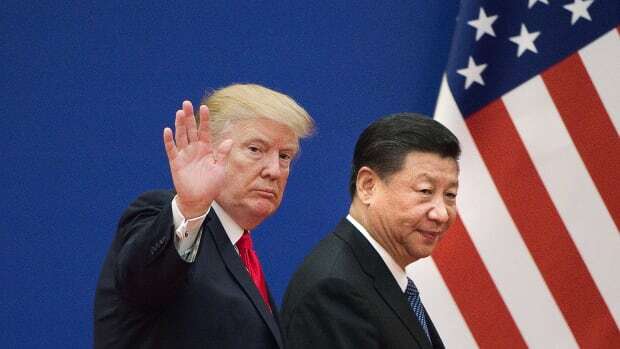 Analysts have expressed that it may be difficult for Washington to weigh in on the human rights of Chinese Muslims when America&apos;s own Muslim communities appear to be under siege. But a basic adherence to rule of law is key to securing civil liberties on both sides of the Pacific. "Surveillance of the American Muslim population is unconstitutional and illegal under U.S. law. China&apos;s persecution of its Uyghur Muslim minority is a violation of the Chinese constitution in addition to international law. All states should be held accountable to their own laws," explains Robert McCaw, director of government affairs at the Council on American-Islamic Relations&apos; national office in Washington, D.C.
Szadziewski suggests that the United Nations might hold Beijing to account for its actions in Xinjiang during its universal periodic review over its human rights this year and that sanctions might help. But Irwin says that Washington has put itself in an especially difficult situation under the Trump administration. "In terms of the use of the rhetoric of terrorism," he says, "the U.S. is still not in the best position, from a strategic perspective, to be pointing fingers in relation to counter terror measures, given abuses from Washington for so many years."